We tend to view body weight on the basis of the external shape and size and what the scales are telling us. But what’s actually going on underneath the surface? The human body is hugely resilient, constantly strengthening muscles and remodeling bones and joints to take up new loads. This harmony is maintained by gravity stimulating the receptors in bone and muscle that regulate the production of growth factors. However as we age, and weight is gained and lost, metabolic changes can take place that alter this remodeling process and can set us on a path to failing mobility and independence. The World Health Organisation defines overweight people as those with a body mass index (BMI) >25kg/m²-29.9kg/m². Obese people are defined by a BMI >30 and a waist to hip circumference ratio greater than 0.9 for men and 0.8 for women. This increases with weight gain and reduces the risk of upper body fracture and osteoporosis. The extra padding around upper limbs can also help to stop fracture of joints. However as weight doubles the impact force on falling affects skin surfaces particularly the lower, unprotected areas such as hip, ankle and knee joints, causing fracture and internal damage. Generally weight gain can impair balance resulting in a greater instance of falls. As activity, function and energy expenditure declines muscles begin to atrophy (get smaller), metabolic rate slows and weight is gained. 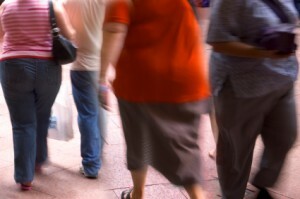 The impact of different types of obesity on mobility. Gynoid obesity affects lower body performance impacting on blood and fluid circulation. Poor circulation can lead to tissue breakdown, cellulitis (an inflammation of connective tissue) causing blisters and leg ulcers. Impaired circulation can lead to varicose veins and pain on exertion. Chaffing of skin on the inside of thighs can make movement unpleasant and impair regular exercise. Android obesity affects the upper body leading to difficulty breathing and metabolic disturbances. As weight is gained centrally around the gall bladder, liver and pancreas the body’s ability to breakdown dietary sugar and fat is impaired and the hormones that suppress appetite are reduced. These changes increase the risk of developing diabetes and heart disease both of which can impact on circulation of blood to the feet and toes causing tissue deterioration over time. Android obesity is also associated with gout when uric acid crystallizes around joints causing pain, swelling and altered gait. Excess weight in childhood slows height growth and reduces the mineral content of bones. Thinner bones lead to more osteoporosis. One UK study in 2010 of 103 children in Sheffield (Dimitri et al 2010) found obese children had an 18% greater incidence of osteoporosis than non-overweight children. The researchers concluded that as fat mass increases, bone density declines, increasing the risk of fracture. With excess weight on growing joints and lower limbs there is a greater risk of malalignment causing knee pain, altered gait and pain on exertion. As children gain weight their involvement in physical activity declines perpetuating excess weight accumulation. Studies have found that compared with healthy weight women (BMI 18.5-24.9kg/m²) underweight women (BMI < 18.5) have lower bone density. They are more likely to suffer fractures of the hip and central body areas and “buckling” of bone injuries than experienced by obese or overweight. Bones naturally become thinner as people grow older because existing bone is broken down faster than the new bone is made. This process of bone thinning speeds up in women following menopause as a result of hormonal change. This association between falling hormone levels, loss of periods and bone density can also be observed in younger women who succumb to eating disorders increasing their risk of osteoporosis and immobility early in life. Changes in diet that reduce protein and energy intake can also impair muscle turnover. These factors combined with fatigue can result in a reduced level of exercise and loss of bone density. Adults are encouraged to achieve and maintain a healthy BMI, particularly as they age. Seek dietary advise early for children who are at either end of the weight spectrum. Exercise daily 60 minutes per day for children and at least 30-60 minutes per day for adults. Recognise that even underweight people need to work on weight-bearing exercise in order to maintain bone density and muscle strength as they age. If you are concerned about the impact that weight may be having on your mobility then contact us to arrange a nutritional assessment.